Journey down the narrow, bumpy road to one of the most unique lunch and brunch spots in the East Bay. 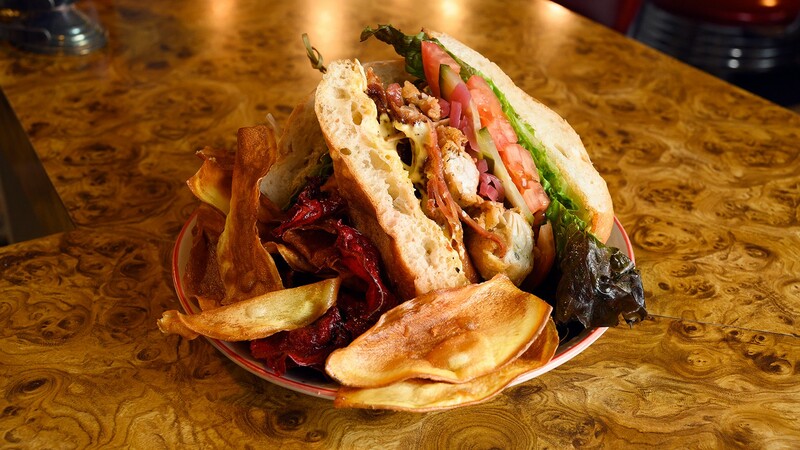 The fried oyster "po'bolt" sandwich might be the best sandwich in the East Bay. The first time I went to Nobilis Restaurant, located in Richmond's Point San Pablo Harbor, I wondered if my GPS had led me astray. I passed the Richmond Rod & Gun Club, traversed an abandoned railroad track, and caught a glimpse of a former winery that resembled a brick castle. Nobilis' chef, Stevie Neal, had a similar experience. "I was riding up that road and ... I thought I was in the wrong spot," he said. "I just went a little further, and it started to open up into the ocean ... and the more I went down, the more beautiful it got." Neal has cooked on both coasts in all kinds of establishments. He started cooking as a teenager at a truck stop in Bordentown, N.J., where he grew up. "I was a dishwasher there, and the cook was showing me how to do eggs and bacon and grits," Neal recalled. "And one day he cut his hand, and the waitresses looked at me and said, 'You're up next,' and I've been cooking ever since." He cooked in Los Angeles during his time in the Marine Corps, and in hotels on both coasts. He also had his own restaurant for 13 years in Matsuyama, Japan. But he said that when he came across Nobilis, "It was like a match made in heaven to me. It was like, this is it, this is the place. ... This little bitty spot right here is where you're gonna do magic at." Nobilis, which opened last summer, is a charming place. The harbor was a filming site for the 1955 movie Blood Alley starring John Wayne and Lauren Bacall. Look around, and you can't see much besides water, boats, and hills. "You feel miles away from urban life," said Yaella Frankel, one of the harbor's owners. There's a giant patio overlooking a small residential marina, perfect for summer days. But the best seats in the house are the glittery red vinyl stools near the kitchen, where you can watch Neal demonstrating his culinary chops. The lunch menu is mostly filled with diner classics; after all, Nobilis calls itself "a finer diner." But what sets Nobilis apart from other diners is the quality of the organic, sustainable ingredients and the attention to detail in the food. And you can tell that Neal cares about his customers. He chats up his regulars and asks everyone how they're liking their burgers, their Benedicts, their oyster sandwiches. Eventually, Neal might start up a conversation with you. Or other customers might ask you what you're eating — it happened to me twice. I started with the clam chowder, garnished with fresh croutons and a swirl of vibrant green parsley oil. It came with plenty of clams and tender potatoes and had a light clam flavor with a touch of cream. Though the soup was thinner than most chowders, I didn't mind. "If I add a whole bunch of roux and a whole bunch of cream, you change the complexity of the clam," Neal said. There's also no bacon in this version; instead, Neal adds depth using fennel bulb, onion, and celery. Next, I tried the "harburger," a burger made with a blend of 80 percent brisket and 20 percent sirloin. The burger was tender and exceptionally juicy, and I liked the crunch from the house-made pickled cucumbers and the caramelized flavor from the onions. I didn't feel the need to add cheese, thanks to the red wine reduction. Even the accompanying housemade chips were superb — on one visit, they were potato chips sprinkled with Old Bay, and on another, they were mixed veggie chips. My favorite sandwich of all — and maybe my current favorite sandwich in the East Bay — was the oyster "po'bolt." It came on a toasted Acme roll smeared with housemade aioli, topped with butter lettuce, crisp bacon, pickled red onions and cucumbers, and petite fried oysters. I enjoyed the combination of textures; each item provided a different type of crunch. Plus, the acidity of the pickled onions and cucumbers prevented the sandwich from feeling too heavy. And I'm not alone in my love for the oyster po'bolt. "I had a person from Louisiana say that's the ... best oyster po'boy he's ever had," Neal said. I came back for brunch, which is only available Saturdays and Sundays. The fried chicken and griddle cakes offered a twist on the typical chicken and waffles. I watched Neal bread and fry a boneless chicken thigh to order, which was served alongside a short stack of golden pancakes. The juicy chicken was nicely seasoned with herbs, and I liked the unexpected flavor of lemon and orange zest in the fluffy pancakes. Even better was the special crab cake Benedict, made by Neal himself using local crab. He uses his twist on a Maryland-style recipe, replacing bell peppers with carrots and shallots. The crab cakes were well-seasoned, and they were served on grilled tomatoes and quality English muffins. Best of all was the Hollandaise sauce, which was buttery and lemony with a hint of Tabasco. The accompanying home fries were exceptionally crisp, with creamy interiors. Don't miss the pies made in-house by Melodie Smith of Melodie's Southern Desserts. I was blown away by the key lime pie on offer that day, which had a buttery, crisp graham cracker crust and a zesty, creamy key lime filling. I watched Neal garnish the pie with berries, artistically drizzling the juice on the plate. Then, he began whisking whipped cream by hand, sweetened with maple syrup and honey. Neal formed the cream into a quenelle, which he gingerly placed on the pie. "You don't just wanna just throw a piece of pie at somebody," Neal said. "We're in the foodie era." 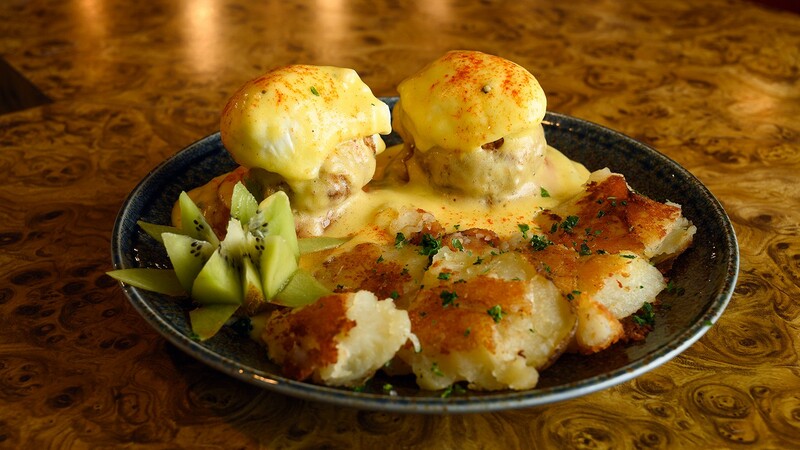 The crab cake Benedict is worth the trip. I asked Neal whether he always makes the whipped cream by hand for every order. He usually makes everything in advance in the morning, "but sometimes ... you [run] out and you go, 'Agh, this last pie, agh!' But sometimes you do, and that's the business," he said. But I get the sense that this attention to detail really comes from Neal's care for his cooking and his customers. "I cook everything like I'm cooking for my mom. So you get the same thing she would get. You know what I'm saying? ... Even if I have to make the Hollandaise all over again. Because ... you came down that road for what? For that Benedict. Well, guess what, I gotta make you that Benedict, then! Hours: Wed.-Fri. 11 a.m.-4 p.m., Sat.-Sun. 10 a.m.-5 p.m.